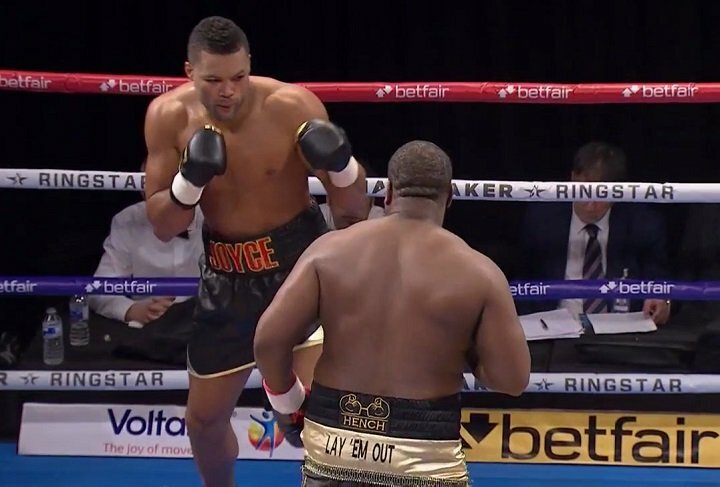 By Scott Gilfoid: 2016 Olympian super heavyweight Joe Joyce (1-0, 1 KOs) will be making his second fight of his career against little known 25-year-old German based Croatian fighter Rudolf Jozic (4-1, 3 KOs) in a scheduled 10 round bout at York Hall at Bethnal Green, in London, UK. I have to say this is a MAJOR step down for the 6’6” Joyce in going from fighting Ian Lewison in his pro debut last October to facing Jozic. I’m not quite sure what went into Joyce’s management selecting Jozic as his opponent for his second pro fight. Joyce is about to turn 33-years-old, and he’s supposed to be on the fast track for a world title fight. But this is more of a fight that you would see someone that is being slow-tracked for a 10-year build up to a world title fight than a guy being fast tracked. For Joyce, it’s hardly worth it for him to be taking a fight of this nature against Jozic. They might as well have dragged someone into the ring for an exhibition match against Joyce, because this is going to do nothing for him. Jozic is from Croatia, and he now lives in Germany. Jozic has wins over these little known fighters: Zoran Grbic, Muhammed Ali Durmaz, Branislav Plavic and SInan Baran. Last year, Jozic was knocked out in the 7th round by Dennis Lewandrowski on February 25. The 23-year-old Lewandrowski would be a decent – but not great – opponent for Joyce to fight. Lewandrowski was trounced by heavyweight contender Tom Schwarz by a lopsided 10 round unanimous decision in June 2016. I’m personally not too high on Schwarz. The fact that Lewandrowski lost to him doesn’t say much about his talent. Moreover, Jozic getting stopped in the 7th round by Lewandrowski tells you all you need to know about him. It’s very disappointing to see Joyce fighting Jozic. Joshua’s management is going to need to start moving him a little faster if they want him to get a title shot by the time he’s 40-years-old. I’m just saying. Joyce was supposed to be fighting frequently. The last time I checked, he hasn’t fought in 3 months since his debut against Lewison. If Joyce’s fight goes ahead in February against the obscure fighter Jozic, he’ll have been out of the ring for 4 months. I don’t think that’s a good idea. Joyce should be fighting every 1 to 2 months in my view. You’ve got a guy that is long in the tooth at 32 in Joyce. You can’t have him fighting just 3 times per year like you would with a fighter with no amateur experience. Even heavyweights from good amateur backgrounds fight more than 3 times per year when they first start their careers. Look at Wladimir Klitschko. After winning an Olympic gold medal in 1996, Wladimir fought 13 times in 1997 at the start of his career. Compare Wladimir’s 13 fights in 1997 to Joyce’s projected 3 to 4 fights in 2018, it’s clear that he’s not being matched nearly enough for him to be fast tracked. If Joyce was being matched like Wladimir was early in his career, he’d get a world title fight well before he’s 36. But with the way Joyce is being matched now, I can’t see him getting a title shot before he hits 40. What a waste. The card is obviously razor thin when it comes to compelling fights, but oh well. That’s how it goes. Perhaps they’ll add some interesting fights to the card, because there’s nothing that is too appealing. Even the main event between the 32-year-old Joyce and the obscure fighter Jozic is a rather dull fight and hardly worth watching in my view.